Daniel Hawksford, Patrick Brennan, Rhys Ap William and Bethan Witcomb. Photo by Robert Workman. On what looks like a landmark day for equality, here's a timely review for you. Coming out as gay can be a fraught and life-changing experience but for Gareth Thomas that experience was especially traumatic. He was captain of the Welsh rugby team at the same time as The Sun threatened to publicly out him, which would mean having to explain his long-held double life to his family, team-mates and fans. 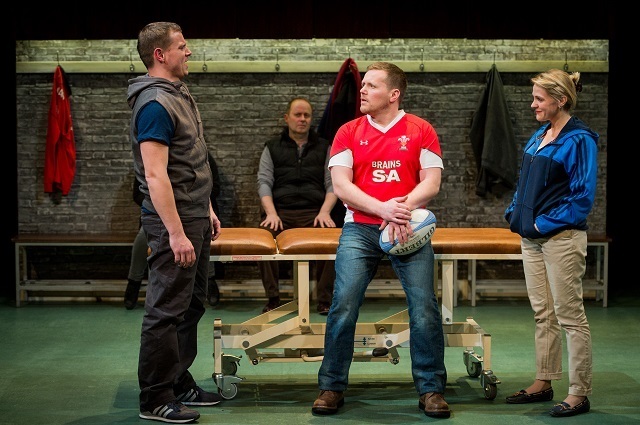 That prolonged personal crisis is at the centre of Robin Soans’s excellent new play Crouch Touch Pause Engage, a collaboration between National Theatre Wales and Out of Joint. Six actors make up a very strong team here, switching parts as they portray not only Thomas but the entire town of Bridgend, plus assorted tabloid hacks, troubled teens and famous faces such as Neil Kinnock. It’s a mighty effort with a lot of words in Soans’s rich script to get through, but no one drops the ball (quite literally) and the end result is a warm, funny play that regularly puts the audience through the emotional wringer. The fragmentary approach to the narrative is a touch confusing at first, especially as Soans folds in details about the Bridgend suicides, a spate of mysterious deaths in Thomas’s hometown that occurred while he was captaining his country. But the succession of short scenes and whirling interchange of characters has the effect of plunging you into a complex moral maze that feels real right from the off. Director Max Stafford-Clark keeps the pace fluid with some bold visual flourishes — a slow motion try, for example, is effectively convincing. For those who enjoyed the recent film Pride, this is a darker yet ultimately equally up-lifting companion. Crouch Touch Pause Engage runs at the Arcola Theatre until 20 June. Tickets £12/£10. Londonist saw this play on a complimentary ticket.